The crew (Matt, Boden, Rob, and myself) had started to gain some confidence climbing mountains and wanted to push our boundaries a little by throwing in some technical climbing routes. There are a couple of rating systems that are used to designate the difficulty and technicality of routes. The most widely used system in North America is the Yosemite Decimal System (YDS). Class 5: Where rock climbing begins in earnest. Climbing involves the use of a rope, belaying, and protection (natural or artificial) to protect the leader from a long fall. Fifth class climbing is further defined by a decimal and letter system – increasing in difficulty. Once above 5.10 the system is broken down into subdivisions (I have never climbed anything above 5th class so I won’t get into how it is rated). 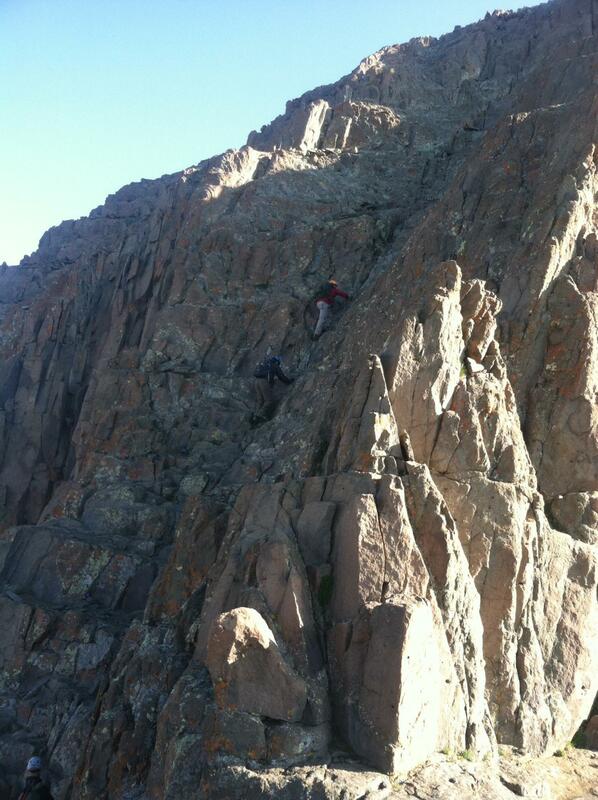 My first real taste of semi-technical climbing was back in July of 2013 on Blanca Peak. Towards the last 100 vertical feet or so you make a few class 2+/3 moves. I remember feeling very exposed and unsure about what I was getting myself into, but I kept moving and ended up having a blast. Technical climbs with exposure have a way of putting life into perspective in a way that simple, Class 1/2 hikes don’t come close to touching. They have a way of forcing you to live in the moment by focusing every second on what is in front of you. A fall on many of these mountains could be your last (no bueno). The week prior to climbing Wetterhorn, myself, Rob, Kyle and Reed headed north to tackle another challenging Class 3/4 route up Torrey’s Peak (trip report coming soon). Just like anything in life, experience is key to success. 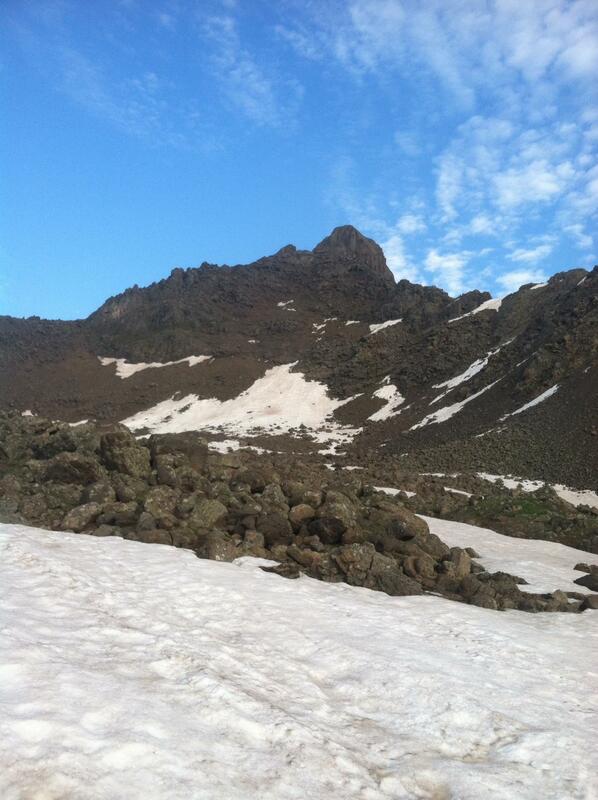 We wanted to prepare ourselves for more challenging climbs by increasing the difficulty. 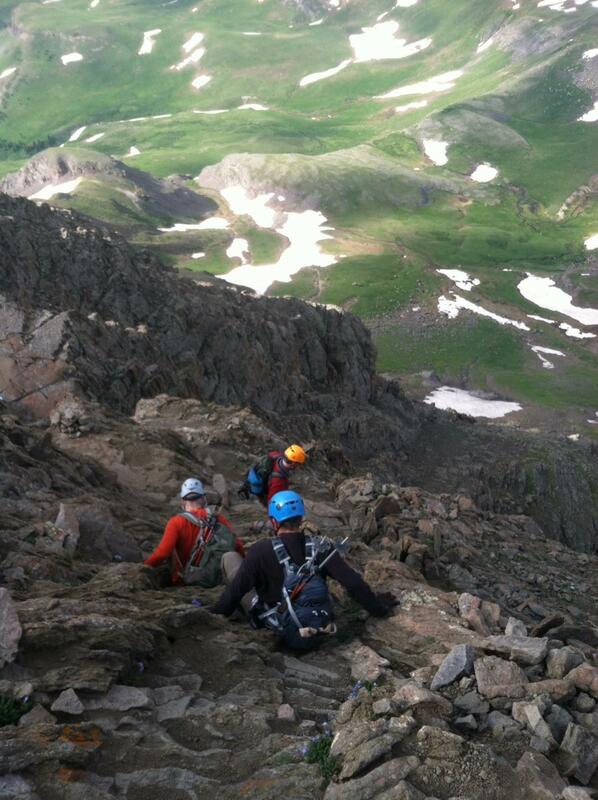 Torrey’s is one of the most climbed 14ers in Colorado because of its locality to I-70. We counted over 300 people on our way down the standard route (another reason to love the San Juan’s – not nearly as many people), but because we had taken the more difficult route up, Kelso’s Ridge, we had only seen a handful of people. Another bonus of challenging yourself is that the more difficult routes are normally less crowded. Wetterhorn Peak had been on our radar for a couple of reasons: 1. it was in the San Juan’s, making it easier for us to access due to the location and travel time and 2. it’s a Class 3 climb with a spectacular, exposed finish. We later dubbed this finish the “Stairway to Heaven”. The drive to the trailhead was about 4 hours (forcing us to leave work early on a Friday…. 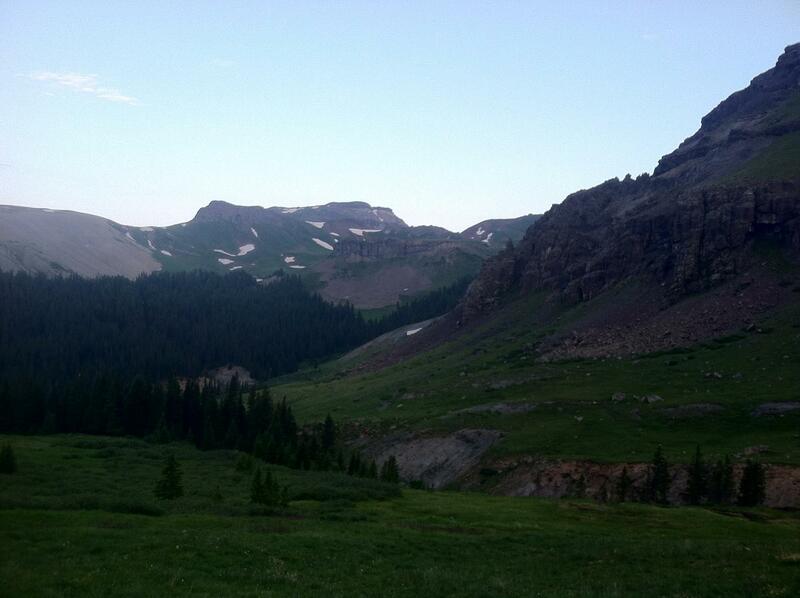 bummer), and once again, we headed east out of Durango toward Lake City and the Uncompahgre Wilderness. This drive winds through a beautiful stretch of the state. Even after traveling the route multiple times, it never really gets old. Once to Lake City, you take the Henson Creek Road (Alpine Loop Scenic Byway) roughly 9 miles to north Henson Creek Road. Make a right hand turn onto north Henson Creek road and continue for 2 more miles until you reach another junction. There will be a sign indicating the Matterhorn Creek trailhead is ahead. This road gets a little rougher, however we saw a couple of low clearance Subaru at the trailhead. We decided to camp below the trailhead in an open meadow next to a creek. There weren’t many designated camp areas below the turnoff to the trailhead, but if I remember right, there are a few further up. The trail starts off following the Matterhorn Creek (hints the name of the trail) until you reach a junction, at which the Matterhorn Creek trail turns left. 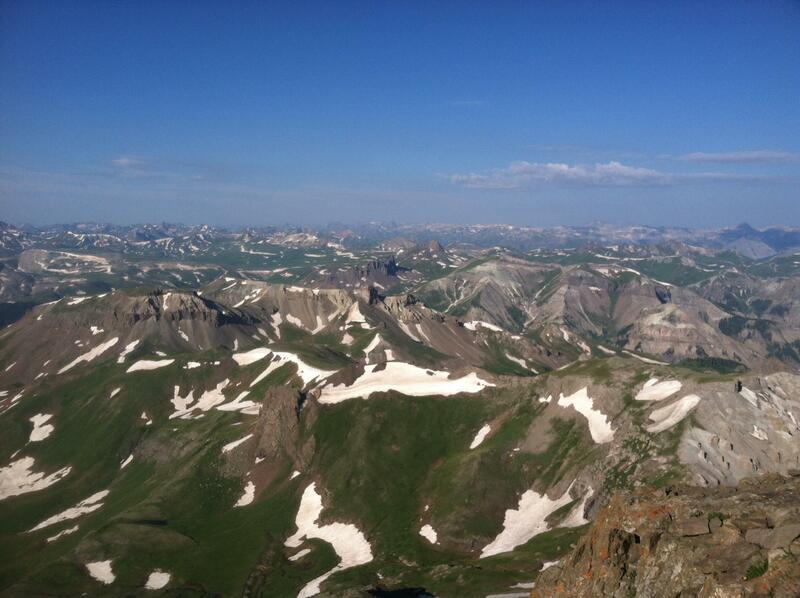 Take a right at this junction and switchback up to roughly 11,300ft. This trail brings you to the Wetterhorn trail where you will hang a left. I wasn’t feeling too great for the majority of this trip (maybe too much whiskey the night before? ), so I hung back a ways from the crew and took my sweet time. 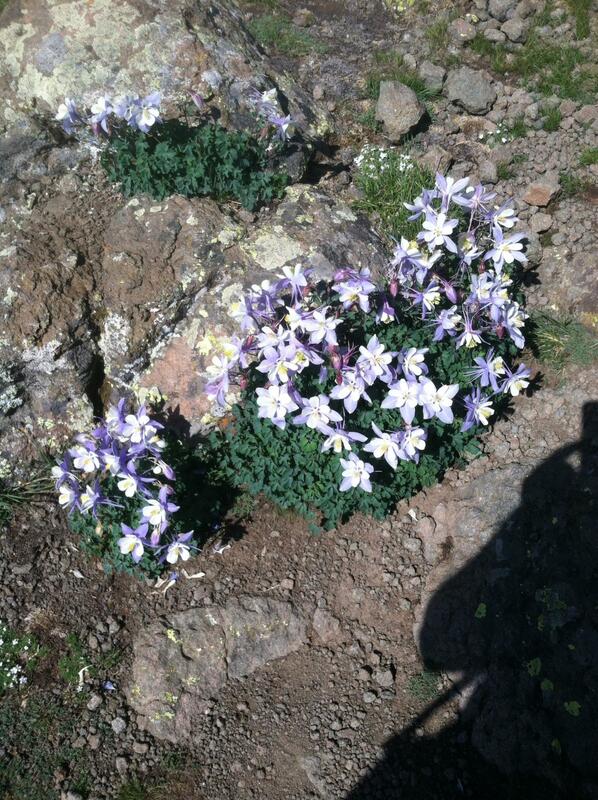 It’s only 3.5 miles and 3,300ft elevation gain to the summit, but it felt a lot longer than that. 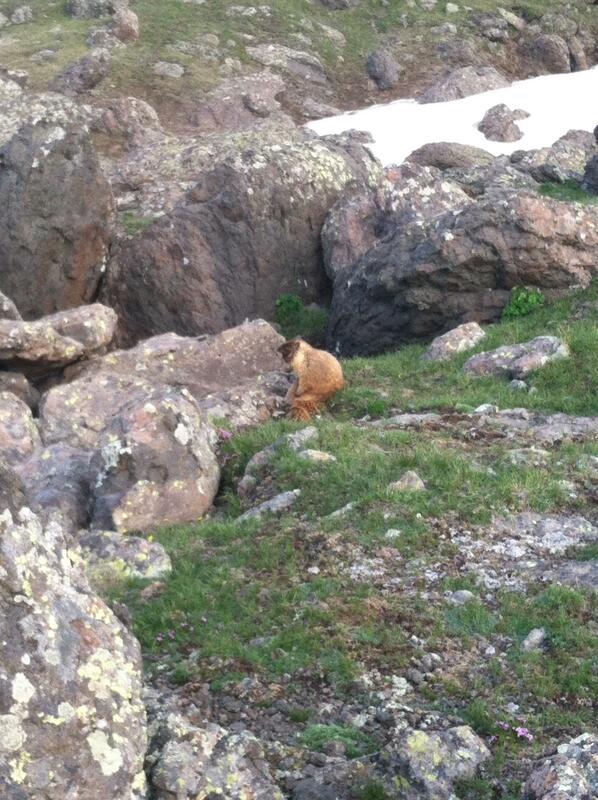 Eventually, you will come to a boulder field that is guarded by a gang of marmots. After bartering with the marmots and trading some granola and whiskey, they finally let us pass. These guys are seasoned veterans in the art of bartering, so come prepared. Rob and I developed detailed, in-depth stories about these little guys. It helps pass the time as well as entertain your fellow hiking buddies. Now this is where all the fun starts. The trail weaves through huge blocks of rock while throwing some Class 2/3 moves at you throughout. After topping out on the ridge you are able to spot a very prominent feature dubbed “the Prow” as it resembles a ships prow. Just north of this feature there is a notch that leads to a steep-ish ramp that when wet could get dicey. At last you have reached the jewel of the climb, the final 100′ of Class 3 climbing. “The Stairway to Heaven” is looking you right in the face. It looks incredibly steep, but the rock is good and the ledges are wide enough to stand on. The exposure is real and a mistake here could be your last. Moments like these are what I live for. They require intense focus and concentration. Your heart is pounding but your mind is clear. The outside world melts away and it is just you and the mountain. This is truly living. 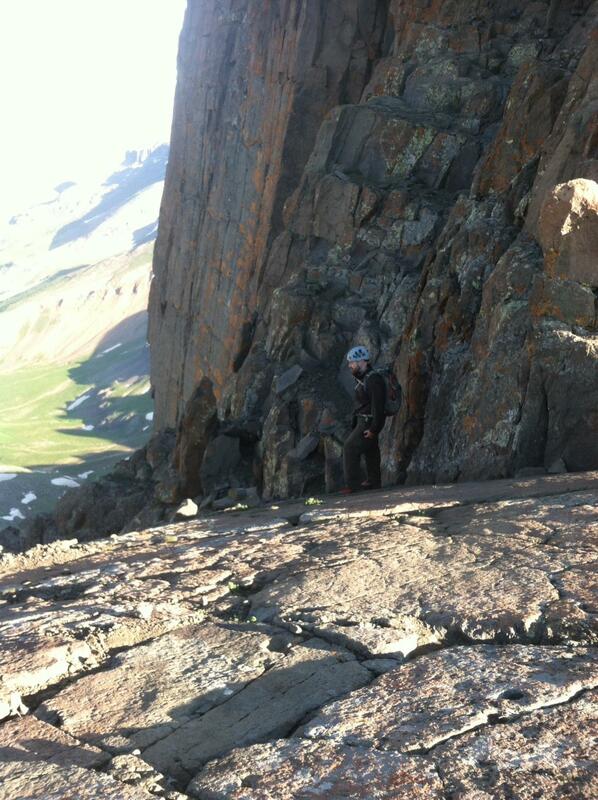 After what only seems like seconds of climbing/scrambling you are topping out on the 49th tallest mountain in Colorado. Whiskey/tequila shots ensued, pictures were taken, naps were had, and roughly 2.5 hours later we were back at the car packing up camp and booking it to the closest restaurant that served chicken fried steak, which happened to be MJ’s cafe in Creede. This place has great food, but don’t expect to show up at lunch and chow down on a delicious CFS as it’s only served for breakfast and dinner (WTF? huge bummer). We stuffed our faces anyway and pilled into the car for the 3 hour drive back to Durango. This climb was a milestone for us as it was the first Class 3 climb we had done as a group (Rob and I had done Kelso Ridge the week before), but it also gave us the sense that conquering all 54-14ers might actually be a reality. After getting back from this trip we started making plans for Chicago Basin, which houses four 14er, one of them being one of the toughest climbs in the state. Stay tuned! Rob had me take this picture for a special lady in his life. He was a thinker AND a doer, as well as a gentleman and a scholar, and we miss him like hell. As always, check out http://www.14ers.com/ for a more detailed trip report.